This entry was posted in Loki Poetry and tagged InfinityWar, loki, LokiDeservesBetter, LokiLives, LokiLove, LokisArmyWillReturn, marvel, ResurrectLoki, spoilers, TomHiddleston on May 8, 2018 by pepi. 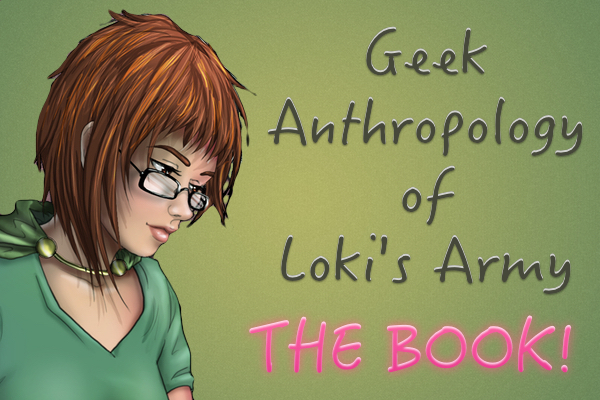 Geek Anthropology of Loki’s Army Kindle Version for free this THORsday! Yay! Geek Anthropology of Loki’s Army Kindle version is available for free this THORsday! I needed to celebrate Xmas before time, you know. It’s fashionable. Coffee shops get Cuppagates; decorations start popping up… so I had to do something Loki! What could I give as a present to an entire Army? A pic of Yours Trully kissing a frog? [Yuck] A book! So, after thinking for a while, I decided that Geek Anthropology of Loki’s Army Kindle version will be available for free today, THORsday 12, 2015. So, if you don’t know Loki yet and want to discover more about him, or if you do and want to know just a little bit more, go ahead and download your copy of the book! This entry was posted in Books, Fans Creativity, Give Aways and tagged give away, loki book on November 12, 2015 by pepi. Loki Fanfiction: No Good Deed Goes Unpunished. This is just some small extracts of chapter 50, things are getting kind of interesting. This entry was posted in Fan Fiction and tagged fan fiction on November 9, 2015 by pepi. Loki Fanfiction: No Good Deed Goes Unpunished. I never though this story would go on that long, but I just uploaded chapter 41 tonight and I´m still a couple of chapters from the end. “As the dust settled they could see Doom on bended knee, he looked defeated, but appearances are often misleading. As he raised his head you could see his eyes inflated with rage, suddenly he spitefully yelled at Thor and Loki. —If I can´t have her no one will! — Next he shoot an energy beam form one of the weapons in his suit, out of reflex both Thor and Loki moved to avoid it only to realize the ray wasn´t intended for either of them. Loki´s eyes widened in horror as he noticed Leah standing in front of the penthouse windows, the ray was meant for her. This entry was posted in Fan Fiction and tagged loki fanfiction on October 6, 2015 by pepi. Loki Giveaway, donation by Angel Campi, the winner! Yay! We have a super amazing Loki Giveaway! Donation by Angel Campi. These are two small Lokis, about 5 inches (13cm) long. They’re super really cute! And we already have a winner!!! Lynne Vest Hamilton congrats!!! You’re the winner of these gorgeous Lokis!! This entry was posted in Give Aways and tagged give away, winners on September 13, 2015 by pepi. Yay! We have a super amazing Loki Giveaway! Donation by Angel Campi. These are two small Lokis, about 5 inches (13cm) long. They’re super really cute! What do you need to do to win them? 1. Like Loki’s Army in Facebook. 3. Leave us in comments your favorite Loki fan art/ picture. This entry was posted in Give Aways and tagged give away on September 7, 2015 by pepi. Khaleesi: Where are you from? K: Why did you start cosplaying as Loki? This entry was posted in Cosplay and tagged cosplay on August 16, 2015 by pepi. We have a book! Geek Anthropology of Loki’s Army! Great news! We have a book! Admin Khaleesi has written Geek Anthropology of Loki’s Army. Yes, it’s one of our Admins! She has spent the last two years writing this amazing book about Loki, Tom and… us!? Wait..what!? Us? Yes! We’re part of the book!! Not only there are great interviews about the book, it talks quite a lot about us! The first part of it is fully dedicated to our beloved Loki. The second part, to Tom and celebrity culture, and the third part… embrace yourselves! Loki’s Army as a whole! Hiddlestoners and Army Members explained. You can find the digital copy of the book here. The paperback is coming soon! Awesome! This entry was posted in Books, Fans Creativity, Hi there! and tagged cool, loki books, news on August 9, 2015 by pepi. Loki Tom Hiddleston Original Watercolour Painting Portrait Loki’s Army is here! Art Studio Kimberly contacted us to choose a picture about Loki so that she could create a gorgeous portrait and then create an auction for a great cause! The masterpiece ended up being a Loki’s Selfie!!! And it is gorgeous! His eyeeees!! Take a look at his eyes!! He does seem to stare at you wherever you move! Bid for this original Loki’s Selfie and help a Dogs Trust Charity in London! This entry was posted in Fan Art, Fans Creativity, Solidarity and tagged fan art, solidarity on July 30, 2015 by pepi. Today we have an awesome Loki Cosplay interview with MiLo Cosplay! Let’s begin! MiLo Cosplay: I am from Germany. MC: He is my favorite Marvel character, so i thought cosplaying him would be fun and it is. It is so much fun. This entry was posted in Cosplay and tagged cosplay, interview on July 29, 2015 by pepi.